How did we get here, and how do we escape? Transforming education would be a start. 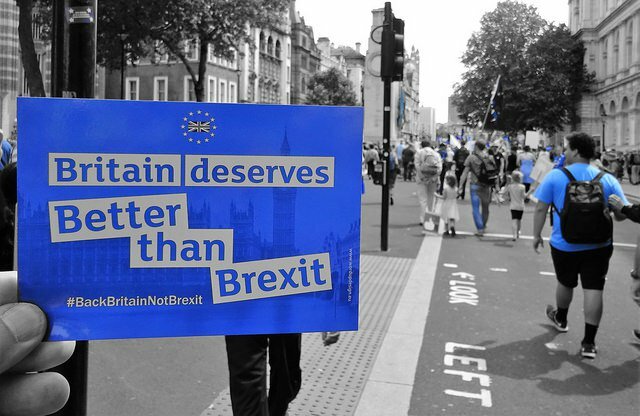 Anti Brexit People's Vote March, London, June 23 2018. Credit: Flickr/David Holt. CC BY 2.0. Stuck in a political twilight zone where the laws of causality are suspended, people stagger around in a kind of waking sickness—a disease whose most worrying symptoms are the mental gymnastics which imagine Brexit as a success and Boris Johnson as Prime Minister. Do you ever think to yourself what the hell is happening? Do you see the Johnson come-what-may-Brexit on the horizon? By bringing disrepute into repute, making arrogance a virtue and carving up politics according to a code known only to insiders, Johnson and company aim to spark a regulatory fire sale that leads us away from a dark European bureaucracy to the sunlit uplands of a butter-side-up Britain. No matter what kind of Brit you are—from Galashiels to Gibraltar—we’re all trapped in the same bizarre mental archipelago: Brexit Island. And we need an explanation of how we arrived here. One overlooked factor is that many of those embroiled in the Brexit narrative boarded at elite schools. Boris Johnson, David Cameron, and Jacob Rees-Mogg went to Eton, and Daniel Hannan—described by journalist Sam Knight as “the man who brought you Brexit” (he also invented that Maoist sound-bite “Project Fear”)—boarded at Marlborough College in the Cotswolds. In his 2014 book Wounded Leaders, Duffell writes that this forces children to develop a “strategic survival personality” characterised by “the maintenance of a facade of confidence and success, masking a rigid emotional illiteracy and intimacy avoidance.” Private school boarders become “pseudo-adults” who employ pathological tics to hide their wounded selves. They bully, they dissemble, they protect themselves with a self-invented carapace—whether it’s hug-a-hoodie Cameron or Johnson’s schoolyard bonhomie. Speaking from France, Duffell tells me that he can see this personality at work. These people have never grown up, giving politics on Brexit Island a timeless quality. Duffell writes that “Boris would have been just as much of a success in 1911 or even 1811.” And the deference shown to such figures indicates a widespread belief that privilege has been fairly earned by those who have it; we’re unable to see the systems that entrench inequality because inequality has become so entrenched. Duffell calls this the “Entitlement Illusion”, a mind trick which allows rulers to feel good about ruling and those ruled to acquiesce. Yet dividing a population into rulers and ruled splinters social cohesion. Foreigners see this, the Scots and Welsh increasingly see this, but if you’re English you have to acclimatise yourself to it; you have to learn to see the privilege anchoring our education system and our whole society in place. And then you see it everywhere. Obviously, schooling on Brexit Island has long been a source of mystique; elite ‘public’ schools such as Eton or Harrow that were originally endowed for the deserving poor (hence their charitable status) couldn’t be further from public control; and the role of grammar schools which operate by selection has always been to get students through their Oxbridge entrance exams (hence the focus on the Latin ‘grammar’). There have always been defenders of this system from both right and left. The 1944 Butler Act sent working-class children to grammar schools via the 11-plus exam. The writer Angela Carter thought this gave Britain its first “full-blooded, enquiring rootless urban intelligentsia which didn’t define itself as a class by what its parents had done”—including filmmaker Ken Loach and journalist Janet Street-Porter. Likewise, with his own brand of working-class boosterism, Nigel Farage has said he wants to see “a grammar school in every town” to emulate his schooling at Dulwich College, where the assisted places scheme gave a few kids a leg over the educational wall. But you never hear from the majority whom selection failed—like my mum for example. Born in Newcastle during World War II, her class took the 11-plus in 1952. Her best friend Wilma was the only one to pass, getting a scholarship to the local grammar school and going on to become a teacher. Everyone else went to the secondary modern, which funnelled the boys to the shipyards on the Tyne and the girls to Wills’ tobacco factory to make Woodbine cigarettes. In an article on grammar schools for the Guardian, Chris Horrie writes that until the 11-plus was phased out in 1976, over 20 million children received a brown envelope containing a state-certified stamp of failure. Little has changed. The recent BBC documentary Grammar Schools: Who Will Get In? told the story of Joanita who, despite her mother working at Poundland to cover the £300 needed each month for extra tuition, still received the same message of failure—by text message this time rather than by post. It’s this failing education system that Melissa Benn diagnoses in her 2011 book School Wars. Scotland and Wales operate a comprehensive system, Northern Ireland is phasing out selection, but England is an educational patchwork, with academies operating outside local authority control, maintained schools overseen by local authorities (former comprehensives that aren’t selective), state-funded grammar schools (that select via exams), and independents (fee-paying schools some of whom, confusingly, retain the title of 'grammar school'). UK education is like quantum theory: if you understand it, you’re obviously mistaken. In her new book Life Lessons: The Case for a National Education Service, Benn makes a convincing case for change. To cut the Gordian educational knot, she makes several proposals that will make many parents, teachers, and heads cheer: abolish Ofsted, give the power to open schools back to local authorities, set up a commission to look at integrating academies into a public system, restore national pay for teachers, get rid of the 11-plus, give teachers their professional autonomy back, and establish an educational trust to advise on bringing private schools under the control of the state. Yet all these reforms could crash on the reefs of social mobility, the resilient ideology wielded by both left and right that has powered the drive towards a 'parentocracy' based on choice, shifting power from producers (teachers and schools) to consumers (parents). And it's not that social mobility is true that keeps us believing in it; historian Selina Todd describes the much-vaunted 1950s as a time when “there were very few golden tickets to go round, and most of them went to the children of privileged parents.” It’s the fact that we act as if it’s true—which inevitably has real consequences. “Imagination is both the fabric of social life and the motor of history” wrote philosopher Simone Weil. There's a cloud of uncertainty and growing elite panic over Brexit, but for the left, a path of ideas leading forward: an industrial strategy, fair taxation, reforming the financial system, and public ownership—all policies in the Labour manifesto—could make Britain a fairer island. A 21st-century National Education Service might transform our archaic system of educational provision. Yet even that won’t be enough: to escape Brexit Island we need to accept that while the Boris Johnsons of this world might well deserve our pity, they certainly don’t deserve our respect.